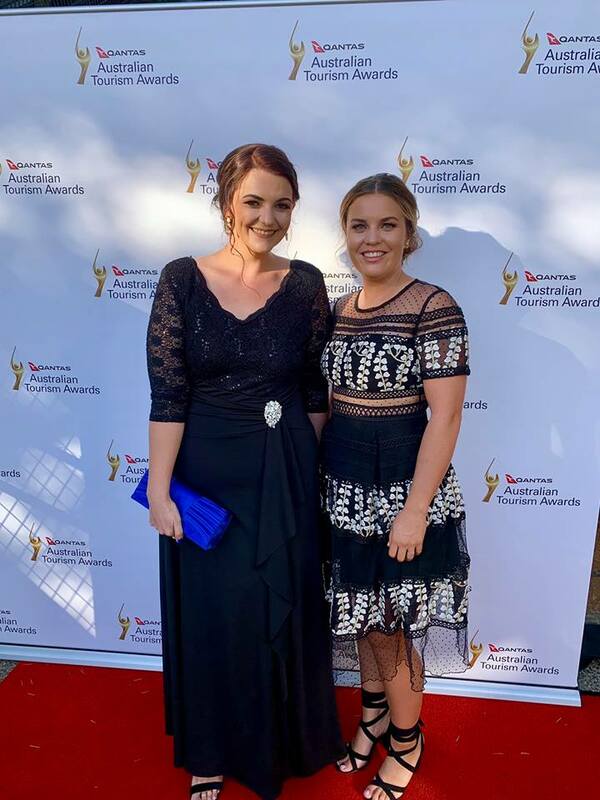 Cape Tribulation based tour operator, Ocean Safari, enjoyed national success for the second time at the 2018 Australian Tourism Awards in Launceston on Friday night, winning silver in the Tour and Transport Operator category. Ocean Safari previously won the same award nationally in 2015 and was also the winner of the Tour and Transport Operator category at the 2018 Queensland Tourism Awards. On a national level, the category had strong competition from six other Australian finalists, who had each also won the category in their relevant state awards. Owners Peter and Jan Claxton were ecstatic with their success on the evening. “We are incredibly proud to have received this recognition and we really want to thank our passionate staff, who do an amazing job running the daily operations in such a remote region such as Cape Tribulation. Their contribution to the overall growth, success and reputation of the business is paramount and of course we can’t fail to also thank all of our guests, agents and industry partners,” said Mr Claxton. “Winning silver as the best tour and transport operator in Australia is a huge achievement and something we are very proud of. We must also congratulate all of the other winners on the night, particularly our fellow Queensland operators,” said Mr Claxton. Peter and Jan described how extremely proud they were to be based in such a beautiful part of Tropical North Queensland. “We are blessed to operate in such a unique area, where the rainforest meets the reef, and the coral reefs which we showcase to guests truly are untouched and pristine. 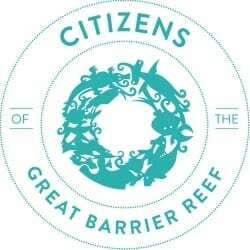 Our team take great pride in their duties to educate and to act as ambassadors in protecting the Great Barrier Reef Marine Park,” Mr Claxton said. Peter and Jan commenced operating Ocean Safari in January 2008 and have seen continuous growth over the years, including the construction of onsite accommodation at Safari Lodge and the onsite eatery, Turtle Rock Café, offering a place for visitors to eat, stay and play in the tropical rainforest. Ocean Safari offers an exhilarating half day eco tour to snorkel the pristine untouched Great Barrier Reef off the Daintree Coast. After a fast 25 minute ride, guests are ready to snorkel two fabulous locations and on most days, the rainforest can be seen along the mainland beach whilst snorkelling the Great Barrier Reef alongside sea turtles, which are found in abundance swimming over reefs full of colourful coral. The Ocean Safari vessel is a semi-rigid inflatable, originally designed as a rescue craft and is driven by twin 350hp engines. The vessel takes 25 passengers, with small groups allowing guests to experience tropical paradise away from the crowds. 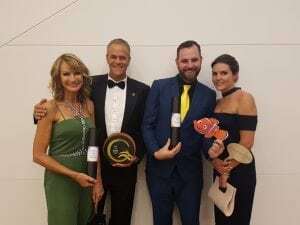 Cape Tribulation based tour operator, Ocean Safari, enjoyed success at the 2018 Queensland Tourism Awards on the Gold Coast on Friday night, winning gold in the Tour and Transport Operator category. To add to the excitement of the night, Ocean Safari’s sister company, Ocean Rafting, which is based in the Whitsundays, won a silver award in the Major Tour and Transport Operator category and the bronze award in the Adventure Tourism category. 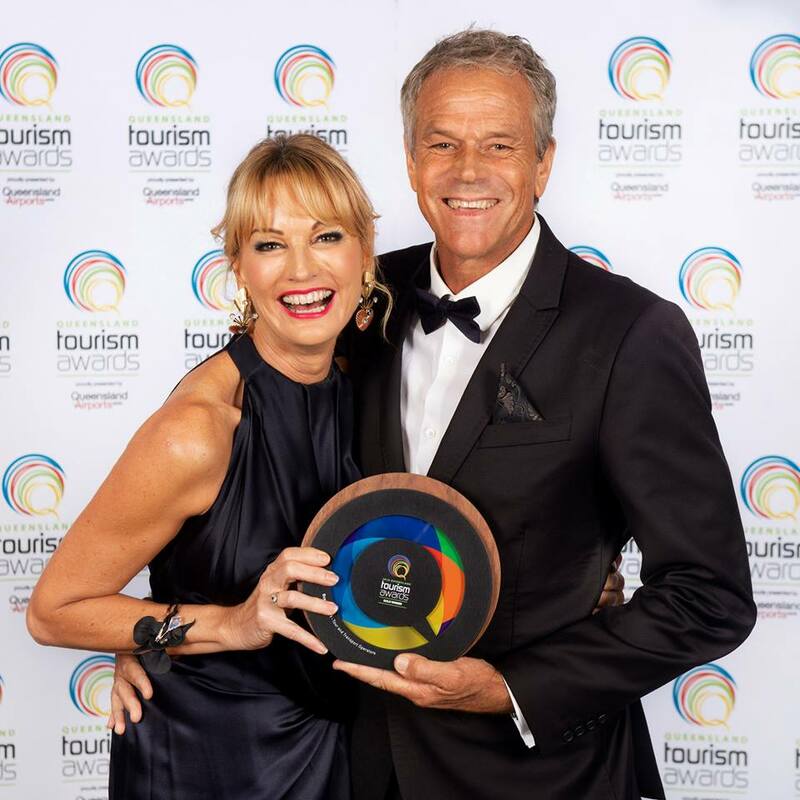 Owners Peter and Jan Claxton attended the 2018 Queensland Tourism Awards ceremony and spoke proudly of their achievements in the three different categories. “It is extremely rewarding and we are full of pride for our teams in both Cape Tribulation and the Whitsundays. Both businesses offer such unique experiences for guests and they are constantly evolving and growing. Our staff play such a big part in all of this and absolutely love what they do and the beautiful natural playgrounds they visit every day. Once again, we must also truly thank all of those who support us, including our guests, agents and industry partners,” said Mrs Claxton. Ocean Safari has seen significant growth and development in recent years, and along with their award-winning tours to the Great Barrier Reef, also offer onsite accommodation at Safari Lodge and funky rainforest eatery, the Turtle Rock Café, offering a complete package for visitors to eat, stay and play in the tropical rainforest. “Winning gold as the best tour and transport operator in Queensland is a huge achievement and something we are extremely proud of. We must also congratulate all of the other winners in Tropical North Queensland and across the state,” said Mrs Claxton. Ocean Safari’s commitment to tourism excellence is also reflected on TripAdvisor, with the company holding the #1 position for tours in Cape Tribulation for the past five years. Ocean Safari will now automatically be included as an entrant in the Australian Tourism Awards which will be held in Launceston in March. Ocean Safari offers an exhilarating ride to snorkel the pristine untouched Great Barrier Reef off the Daintree Coast. 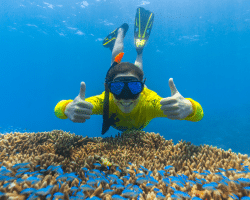 The half day eco tour takes a maximum of 25 passengers and visits two different snorkel destinations, each with an extraordinary array of marine life and coral species. After a fast 25 minute ride, guests are ready to snorkel two fabulous location and on most days, the rainforest can be seen along the mainland beach whilst snorkelling the Great Barrier Reef alongside sea turtles, which are found in abundance swimming over reefs full of colourful coral. Ocean Safari Cape Tribulation came home with a silver award in the Tour and Transport Operator category at the Queensland Tourism Awards in Brisbane on Friday night. Sister company Ocean Rafting Whitsundays also won gold in the Major Tour and Transport Operator category and Bronze in the Adventure Tourism category. Owners Peter and Jan Claxton attended the awards ceremony and spoke proudly of their achievements in the three different categories. “It is extremely rewarding and we are full of pride for our teams in both the Whitsundays and Cape Tribulation. Both businesses offer such unique experiences for guests and they are constantly evolving and growing. Our staff play such a big part in all of this and absolutely love what they do and the beautiful natural playgrounds they visit every day,” said Ms Claxton. Ocean Safari enjoyed success at the Queensland Tourism Awards in Brisbane on Friday night, winning bronze in The Steve Irwin Award for Ecotourism category. Owners Peter and Jan Claxton attended the awards ceremony and spoke proudly of the achievement. “We are so thrilled to have won Bronze in The Steve Irwin Award for Ecotourism category at the Queensland Tourism Awards. We are especially proud to be honoured in this category as we are passionate ambassadors for ecologically sustainable tourism in this beautiful region where the Daintree Rainforest meets the Great Barrier Reef, two world heritage areas side by side,” said Jan.
“It is extremely rewarding and we are so proud of our team based at Cape Tribulation. Operating in a relatively remote region can sometimes present operational challenges but our team do an amazing job of running such a tight ship. Not only do they work hard running daily tours to the Great Barrier Reef with Ocean Safari, but also do a fantastic job in operating our onsite accommodation and café, Safari Lodge and Turtle Rock Café, offering a place for visitors to eat, stay and play in the tropical rainforest. We must also truly thank all of those who support us, including our guests, agents and industry partners and congratulate all the other winners of the night,” said Jan. The win follows on the back of Ocean Safari’s success last year, winning gold in the Tour and Transport Operator category at a Queensland level and silver on a national level at the Australian Tourism Awards. To add to the excitement of the night, Ocean Rafting’s sister company, Ocean Rafting, which is based in the Whitsundays, won a Gold award in the Major Tour and/or Transport Operator category. Previously known as Jungle Lodge, Ocean Safari’s onsite accommodation is now known as Safari Lodge. Far away from the stresses of city life, with no mobile phones and TV, the Safari Lodge offers Cape Tribulation accommodation sitting happily between two world heritage areas. Onsite facilities include cosy and comfortable Safari Huts (quad share, twin or king), camp sites, swimming pool, camp kitchen, amenities block with toilets and showers and laundry. Sleep in the jungle and enjoy the sounds of the rainforest at night, or rise early to experience the sunrise over beautiful Myall beach only minutes away. Along with the Turtle Rock Cafe and Ocean Safari, the Safari Lodge site offers a complete Cape Tribulation package, featuring onsite Cape Tribulation accommodation, dining and Great Barrier Reef tours.